In this Nov. 6, 2018, file photo, Rep. Tulsi Gabbard, D-Hawaii, greets supporters in Honolulu. 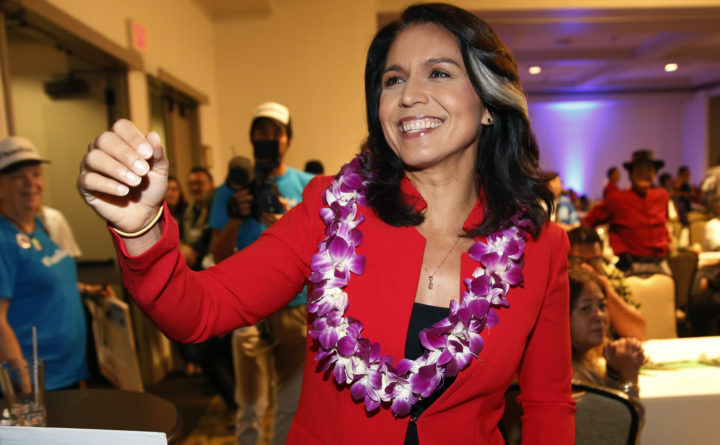 WASHINGTON — Democratic Rep. Tulsi Gabbard of Hawaii has announced that she is running for president in 2020. The 37-year-old Iraq War veteran is the first Hindu elected to Congress and the first member born in the U.S. territory of American Samoa. She has visited early primary and caucus states New Hampshire and Iowa in recent months and has written a memoir that’s due to be published in May. Gabbard is joining what is expected to be a crowded Democratic field. Sen. Elizabeth Warren of Massachusetts has already formed an exploratory committee and is moving quickly with trips across early primary states. California Sen. Kamala Harris, New Jersey Sen. Cory Booker and Vermont Sen. Bernie Sanders are all weighing their own presidential bids and are expected to announce decisions in the upcoming weeks. Former Obama administration housing chief Julian Castro announced his run for the presidency on Saturday. Gabbard’s run would not be without controversy. In 2016, she alarmed fellow Democrats when she met with Donald Trump during his transition to president and later when she took a secret trip to Syria and met with President Bashar Assad, who has been accused of war crimes and genocide. She questioned whether he was responsible for a chemical attack on civilians that killed dozens and led the U.S. to attack a Syrian air base. She said she doesn’t regret the trip and considers it important to meet with adversaries if “you are serious about pursuing peace.” She also noted that the 2003 invasion of Iraq was based on faulty intelligence and said that she wanted to understand the evidence of the Syria attack. Asked last year whether she would still consider running if Sanders ran, Gabbard said Sanders is a friend and she didn’t know what his plans were. “I’m thinking through how I can best be of service and I’ll make my decision based on that,” she said.